I went through the process of turning 50 the other day. Honestly, it didn’t hurt a bit. Except when I whacked myself with my glow-in-the-dark poi (Balls on strings that you whirl about in patterns – theoretically in a graceful manner.) But that happened because I was practicing growing old disgracefully. And playing. 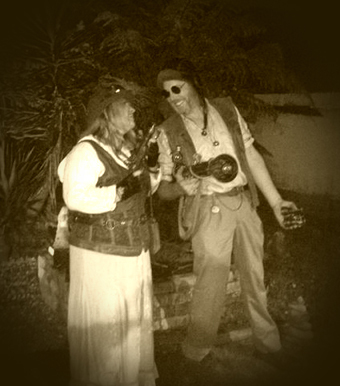 Oh, and attending my own 50th Birth Anniversary Steampunk Soiree. I’m not running around after kids any more. They have to ring me and make an appointment. No longer am I as green as I am cabbage-looking. If it barks like a dog, it’s definitely a canine quadruped. I’m a lot more relaxed. There’s a lot to be said for ‘Don’t sweat the small stuff.’ Such as laughing when you sit on a toilet in the dark on a cold night and the lid’s down. And forgiving when someone is rude to you. Those who are habitually impolite will bang into more closed doors than they’ve had breakfasts, throughout their lives. Bless ’em. I don’t live much of my life by how other’s expect me to, as I used to. Now, for instance, if I get sprung with an untidy home, I don’t give a damn. My true friends know to just push the piles aside and find a seat wherever. We have important things to do – like open the wine. I feel very privileged to have lived for 50 years and counting. Many don’t. I’m now old enough to start planning what sort of coffin I want, without people wondering if I’ve suddenly become an Emo. 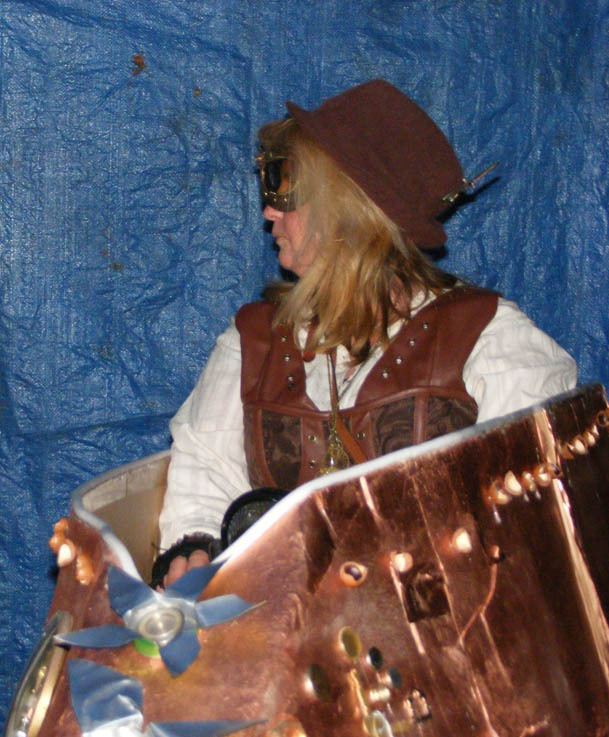 I did want a Corvette Stingray, but since I became converted to Steampunk, I’ve been looking around for gears and cogs. I’ve lived long enough to see patterns and seasons in life. All things come and go. Paisley, for instance. And Doctor Who. I can laugh at myself. Believe me, there’s plenty of fodder there. ‘Steampunk is a sub-genre of science fiction that typically features steam-powered machinery, especially in a setting inspired by industrialized Western civilization during the 19th century. 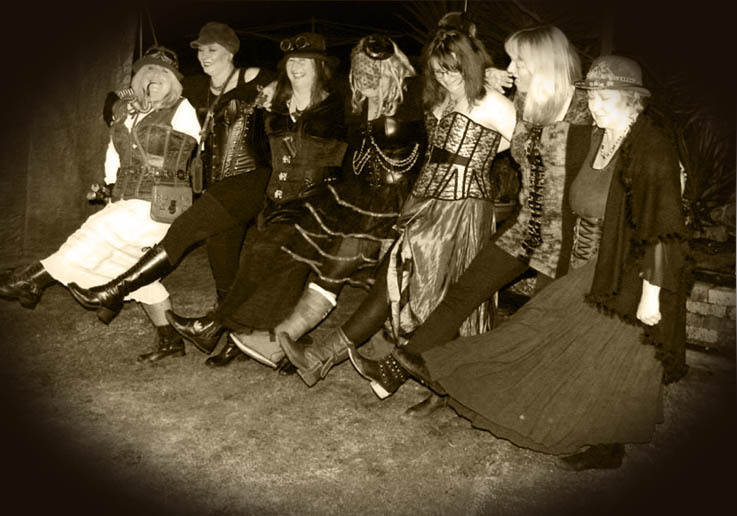 Therefore, steampunk works are often set in an alternative history of the 19th century’s British Victorian era or American “Wild West”, in a post-apocalyptic future during which steam power has regained mainstream use, or in a fantasy world that similarly employs steam power. Steampunk perhaps most recognizably features anachronistic technologies or retro-futuristic inventions as people in the 19th century might have envisioned them, and is likewise rooted in the era’s perspective on fashion, culture, architectural style, and art. Such technology may include fictional machines like those found in the works of H. G. Wells and Jules Verne, or the modern authors Philip Pullman, Scott Westerfeld, Stephen Hunt and China Miéville. Other examples of steampunk contain alternative history-style presentations of such technology as lighter-than-air airships, analog computers, or such digital mechanical computers as Charles Babbage‘s Analytical Engine. 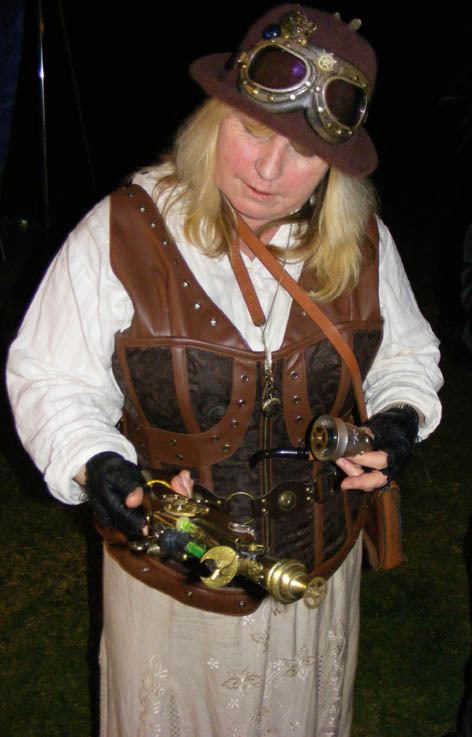 Steampunk may also, though not necessarily, incorporate additional elements from the genres of fantasy, horror, historical fiction, alternate history, or other branches of speculative fiction, making it often a hybrid genre. 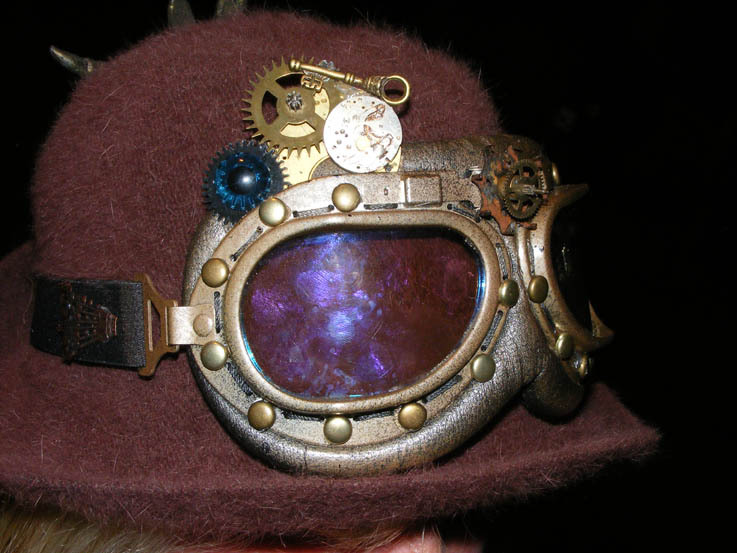 The term steampunk’s first known appearance was in 1987, though it now retroactively refers to many works of fiction created even as far back as the 1950s or 1960s. Bring the blighters on!! We have the Blunderbuss of all Blunderbusses!! On the evening of my birth anniversary, some dear, long-term friends and I got together and dressed up in corsets, all manner of hats, plus-fours, long skirts, lace-up boots, fish net stockings, lacy fingerless gloves, braces and other peculiarities, and draped ourselves with assorted accoutrements such as pocket-watches, goggles, cogs, glow-in-the-dark tubing, insects and leather bits, and a nice array of ray gun weaponry. As you do. NEVER leave the house to go on an adventure without safety headwear and a decent pair of comenearascopes. A couple of friends turned up in ‘The Intripidator’ – a mobility scooter doozied up to look like a time-space-continuum-travelling vehicular device. It runs on macadamia nuts, apparently. But they, I was informed, were solicitous enough to pause at the Give Way signs both on the way there and on the way home. 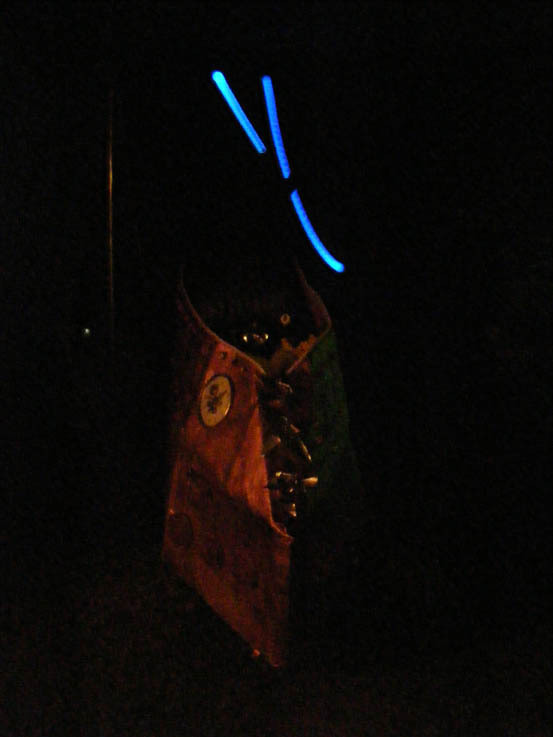 Another couple considerately hid their laser-emitting sawn-off shotgun under their outerwear whilst strolling towards our soiree venue via the darkened streets of town. That’s what I like about these friends of mine – they’re a thoughtful lot. The Intripidator – primed and ready for multi-dimensional travel. And we had ourselves a grand old time. We swanned and strutted, swanked and swished, swilled and swallowed various refreshments and comestibles, clapped and ululated at the belly dancers that kindly graced us with their skills, had grand battles with assorted fabulous and hypothetically deadly weaponry, drove The Intripidator hither and to various and sundry timewarps, and finished the evening with a nice little open fire and some erudite (and largely ridiculous) poetry. I couldn’t have wished for a better way to proclaim and celebrate my maturity if I tried. The epitome of idiocy. Or in my world, celebrating your maturity. There’s a big difference between growing old and maturing, you see. Growing old is a state of mind, where one starts to curl up on the inside and it sooner or later shows on the outside. Maturing includes having as much fun and adventure as you can while you can still do so because you realize that your physical capacity for this will only last so long. As long as no one gets hurt, of course, it’s all good. Apart from the blue-bagged hepticon and red-lipped batfishy necromantas. As far as I’m concerned, if those things invade your soiree, haul out your blunderbuss and shoot the blighters, I say! 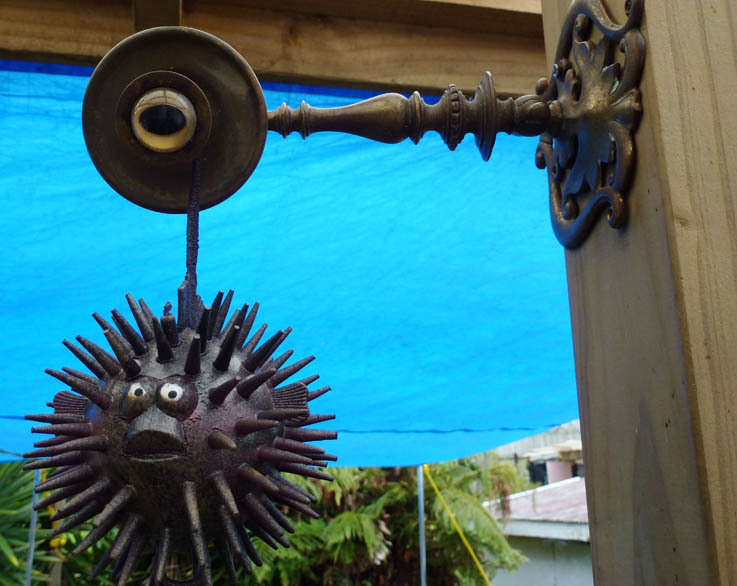 A very alarmed lesser-spiked flabberfish suspendicated by a piece of flabberfish-supporting Victorian suspecticator equipment. Are you growing old or maturing? How do you go about it? 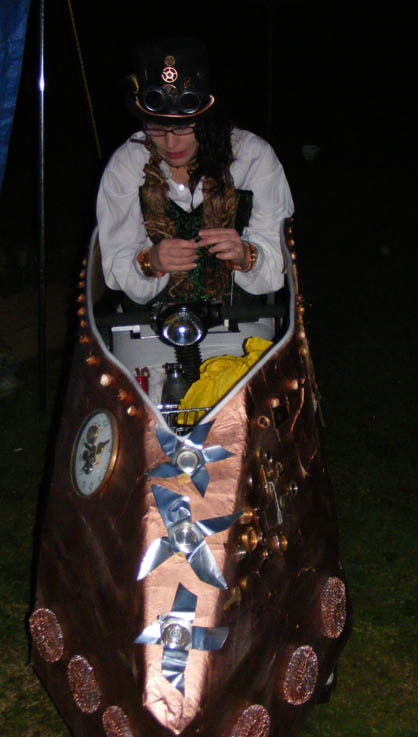 This entry was posted in Ravings - random wafflings, Steampunk and tagged 50, Ageing, Friendship, Fun, Growing Old, Maturing, Soiree, Steampunk, Turning 50. Bookmark the permalink. There is no way you can or should be called normal shorty. Lol. Great read. Looking forward to reading more of your blurbs. Arohamai. Cheers Rod. The day I become normal, start building my coffin because I’m obviously running out of steam.